Instead of announcing the next version of its iconic operating system in front of a massive crowd of thousands, Microsoft chose an intimate venue with 50 or so reporters to launch the new Windows, which it's calling Windows 10. The company looks at the new number (yes, it oddly skipped a number) as an indication of the direction it's taking with the OS; Microsoft says it'll be "the most comprehensive platform ever," featuring a full range of products that'll be placed under the Windows 10 umbrella as part of "one tailored experience." That means it will support everything from the "Internet of Things" to enterprise servers, taking advantage of responsive design. Microsoft's Joe Belfiore showed off an early beta version of the new Windows on stage, which looks very much like the leaked screenshots we saw not too long ago; Belfiore says that the company wanted to bring the familiarity of Windows 7 and combine it with the functionality of Windows 8. The new Windows will look very familiar if you're used to either of the the last two versions, though Win8 users will notice that the Modern UI is nowhere to be seen at first (more on this later). Instead, the series of Live Tiles can be found in the Start Menu off to the right side, with the usual Win7-style set of pinned and frequent apps on the left side, along with web and app search underneath. Not only can the tiles be resized, but also the Start Menu can likewise be resized as well. 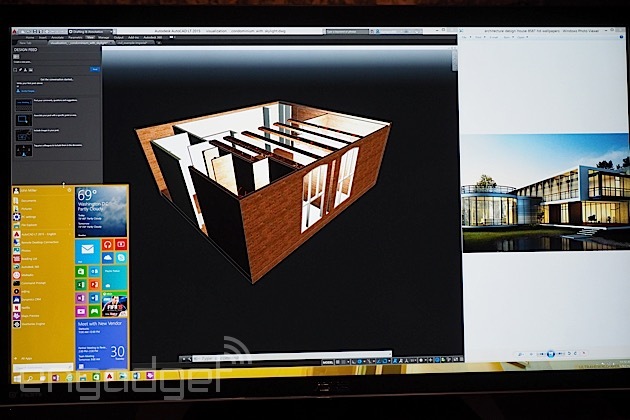 Microsoft said you can even expand the menu to go beyond the boundaries of your monitor, so you can scroll to the left and right to see the entire lineup of apps and tiles. It also comes with a refreshed taskbar that comes with a new "task view," which shows all of the apps that are running in each virtual desktop; your current desktop is primarily shown on the screen, but you'll see a few thumbnails down below that give you the option to switch between desktops (or add a new one, if you prefer). You can also snap up to four apps on the same screen in a quadrant layout. This is different from the standard ALT+TAB command, which brings up every running app from every desktop. Additionally, Windows 10 also gets a nice improvement to the command prompt: Now you can use keyboard shortcuts, as well as copy and paste. While Microsoft admits that this isn't exactly the most exciting news, there are plenty of die-hard Windows users who have been eagerly awaiting this feature for a long time. So far, the native apps that Microsoft demoed, such as Mail and Calendar, show responsive design that adjusts your view as you resize them. The Mail app, for example, can stretch anywhere from a single-pane to triple-pane view, depending on how you view it; likewise, the Calendar app can show either a single day (if you've narrowed the app to a small vertical sliver) or a full week (for any larger view). These are just a couple instances of the design, which likely will be open to developers. The Charms Bar is still there, though it may not look exactly the same when the final build comes out -- Microsoft says that the UI is still not final and it expects to change it between now and then -- and plenty of touch elements and gestures will be carried over from Windows 8. In the meantime, Microsoft isn't giving out any additional details on the touch mode, aside from the fact that with Win10, the company will make it possible for the OS to dynamically adjust the UI based on what mode you're using; if you're using a keyboard and mouse, your user interface will be slightly different than if you're going into touch mode. Oh, and about the Modern UI mode from Win8? Microsoft didn't want to place too much attention onto it today, but it did indicate that it shows up as a "large Start Menu" when you're in touch mode. (You'll also see a back button on the taskbar.) If you're using a keyboard and mouse, however, it appears that you'll enjoy the desktop experience instead. The team only showed a few bits of Windows 10 today, but they'll continue to add more pieces to the puzzle over the course of the next year as Microsoft prepares for a late 2015 launch. For instance, we'll see more of the system at the company's Build conference next Spring. That said, Microsoft will be launching an Insider Program tomorrow, which is designed to give the initial Win10 experience (also known as the Technical Preview) to folks who have a deeper knowledge of the OS. Belfiore insists that the new Windows will give full functionality for everyone from beginners and novices to advanced users once it launches, however. But what's most important is the fact that Microsoft tried really hard to distance itself from Windows 8. Even skipping numeric order and opting for Windows 10 instead is a clear indication of this; perhaps Microsoft feels that the number 9 is guilty by association? When it comes to Windows Phone, Microsoft is keeping pretty quiet about its plans, only mentioning that "it'll be a natural step forward in the evolution of the phone." Belfiore stated that the company wants to strike a blend between phones, tablets and larger devices. It'll also be interesting to see if Microsoft dubs the mobile OS Windows Phone 10, or if no distinction will be made.